Alfordsville, Indiana, is a very small town located in Reeve Township. Though the town may be tiny, it has a lot to offer its residents. People living in Alfordsville take pride in the fact that it offers them a safe place to live, play, and raise a family. Whether you live in a large city or a small town, the pest professionals at Action Pest Control are dedicated to helping you keep your home free of a wide variety of pests through our safe, affordable, and effective pest control services. Find out why so many people choose to trust Action Pest to control and eliminate pests in their homes and businesses. There are a variety of pests that can succeed at entering your home to forage for food and to nest. The best way to control pests like ladybugs, spiders, flies, roaches, ants, rodents, and many others is to put in place a year-round pest control program. Residential pest control programs work to defend your home against structural damage, protect your belongings from being destroyed, and keep you and your family from coming into contact with the diseases these pests spread. Our Complete pest control program includes exterior pest defense, interior pest control services, termite monitoring, and termite inspection. This program also includes cobweb removal, rodent control, window sill vacuuming, unlimited service calls, and many other services. It is a comprehensive program that offers effective control and prevention solutions. For even more inclusive pest protection for your home, our Premier pest control program includes everything that is in the Complete program in addition to our termite treatment services and our termite warranty. Termites are a very destructive pest that can cause a lot of stress and financial strain for homeowners. The only effective way to eliminate and control these damaging pests is through professional termite control measures. Action Pest Control has developed a very effective way to completely eliminate termites from your Alfordsville property through our comprehensive Five-Step Termite Control System. Our termite control system begins with an initial comprehensive inspection that is completed by one of our licensed professionals. Next, treatment is completed with Termidor® which works to eliminate termites through both ingestion and contact. Then, a follow-up three-month termite elimination inspection is performed to be sure that all the termites have been eliminated. We are so confident that our termite control system is effective that we guarantee our termite elimination products to be 100% effective in getting rid of your home’s termite infestation in three months or less. Lastly, we perform an annual termite inspection to make sure that your home remains termite-free. Plus, we offer a money-back guarantee and damage control warranty, to give you total peace of mind when it comes to termites! If you see any sign of termites living in your home call us immediately to schedule a termite inspection for your Alfordsville home! Signs may include: swarmers (winged termites), hard pepper-like droppings along the floor or on window sills, the presence of mud tubes traveling to or on your home, and/or wood damage. Any pest problem is stressful, but having a bed bug infestation in your home can be extremely stressful. Along with the red itchy bites, bed bugs can cause homeowners to lose sleep and can cause them to practically lose their sanity. The only effective way to get rid of every single bed bug in your home is with the help of trained, experienced professionals. A bed bug inspection completed by one of our trained bed bug detection dog teams. Our specially trained dogs can find any adult, larvae, or egg that is living in your property. If bed bugs are discovered, treatment will be provided using our heat remediation services. Heat remediation is environmentally friendly, does not require the use of chemicals, is non-invasive, requires only one day of treatment, and allows you to immediately re-enter your home. Contact us today to learn more about the signs of bed bugs or to schedule a bed bug inspection for your property! Why Choose Action Pest Control? Action Pest Control is a QualityPro certified company that provides effective, modern, safe, affordable solutions to pest problems. 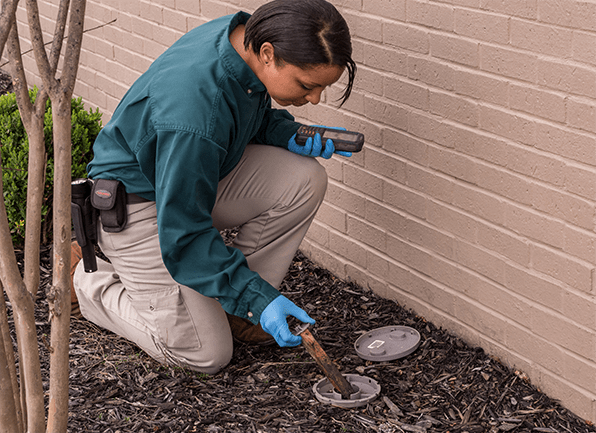 We employ over 70 well-trained pest management professionals and have board-certified entomologists on staff. Our staff is capable of handling any pest problem using modern technology that is effective, safe, and affordable. Action Pest Control understands that there is no ‘one solution’ for pest problems and that each family and property has its own unique needs. Because of this, we are committed to ensuring that each of our pest control services can be customized to fit the unique needs of your Alfordsville, Indiana home. In addition to termite control services, bed bug control services, and home pest control services, we also offer our customers mosquito control services to reduce the number of these dangerous pests living on your property. For our commercial customers, we offer effective solutions to prevent pests in your facility along with fumigation services, pest bird control, and lawn care services.